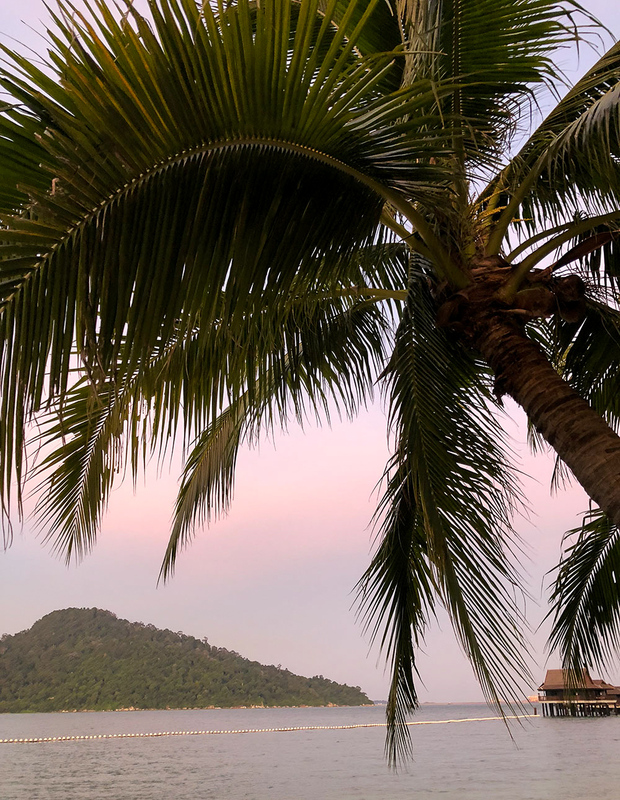 Your first glimpse of the privately-owned island that houses Pangkor Laut Resort will immediately confirm expectations of what a pure luxury resort should be. Three miles off the west coast of Malaysia along the Straits of Malacca, as the jungle oasis pulls into view it is resplendent with manicured gardens, glistening beaches and friendly smiles adorning the faces of the welcoming staff team. But there is more than just beauty to this age-old nature reserve and as you pull back the layers of the tropical isle and will find a resort with a rich and colourful history, tended to by a team who care greatly about the conservation and preservation of its future. Whisked through the sole landing strip that is Ipoh airport, to awaiting transportation which will take you a comfortable 1.5 hours drive before an awaiting boat ferries you over to the private island, the guest experience and an premier level of customer service covers you long before you arrive at Pangkor Laut Resort itself. But it is a consistent theme followed through for the duration of your stay, with each of your needs attended to with gentle, welcoming staff who take pride in their jungle paradise. When you first dock up onto the private jetty of Pangkor Laut, you will catch sight of just a few of the 140 villas that are sophisticatedly immersed into the serene forest and sparkling sea that frames the island. It is only when you gaze deeper into the jungle hillside you will notice the seamlessly blended mix of accommodation into the natural environs. From the spa villas perched on stilts over the sea, to the beach villas along the sandy white beach and the garden villas set into the lush tropical gardens or the hill villas sitting along the dramatic rainforest hillside, offering sweeping views out across the resort to the sea beyond, there is an abode to suit every guest. Pure luxury that highlights the natural beauty of the estate seems to be the theme of Pangkor Laut, and indeed, being the sole resort situated on the 300-acre island, there is a sense of seclusion and exclusivity that comes with the benefit of extensive privacy (You can even find adults only areas of the resort for those who want to stay away from little eyes, if you so desire.) Again, the theme comes forth within each guest villa’s appointments – the advantageous views from secluded balconies, deep baths for relaxing soaks and crisp linens to keep your cool as you rest at night. The ancient rainforest covering Pangkor Laut is not the sole historical attraction of Pangkor Laut. In 1945, British colonel, Freddy Spencer Chapman, became one of the first Europeans to make the island his landing spot. For a brief, but memorable, 36 hours, the island experience of Spencer Chapman would make the resort a pivotal destination for adventures to visit in years to come. After spending over three years hiding from the Japanese in the jungles of Malaya, he swam his way to Pangkor Laut’s beautiful Emerald Bay where he then escaped by submarine. This colourful past now sets the scene for an annual challenge in his honour "The Chapman Challenge". An “ode to the unbreakable strength that lays within the human spirit”, the challenge involves a 3.8km road run around the island and 2.4km through untouched rainforest, followed by a 1km swim across Emerald Bay. 80% of the 300 acres of Pangkor Laut Resort is still covered by one of the oldest rainforests in the world. Aged at approximately two million years old, this impressive natural heritage is a major coup for the resort and its history is honoured by daily nature walks guided by the resident naturalist, Aris. 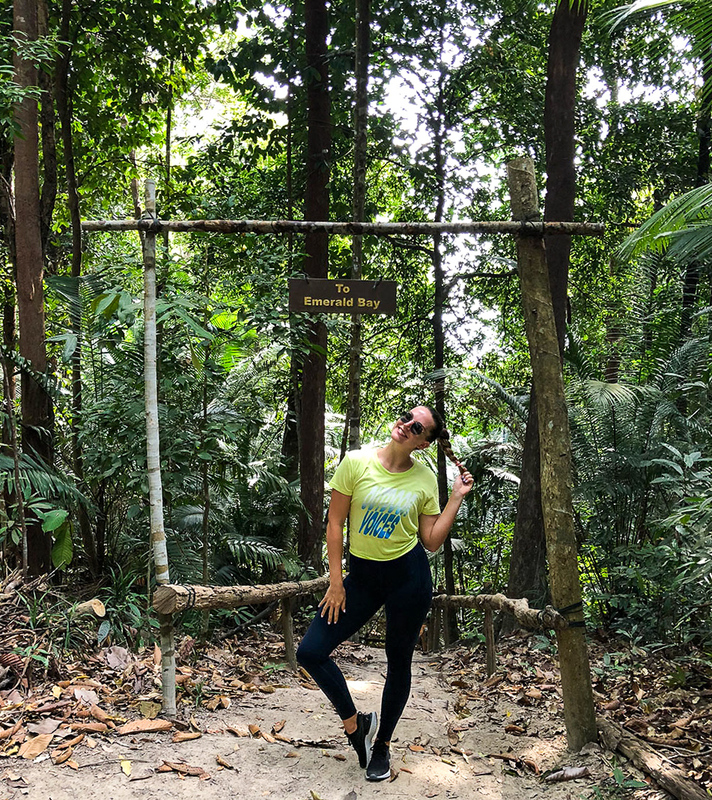 A passionate and engaging educator, Aris’ jungle trail treks provide insight of the islands ecosystem and offer an opportunity to glimpse some of the colourful animals and plants which call Pangkor Laut home. Whether you opt for the shorter 45 minute or the full two-hour route, you will see an expanse of rainforest, climb across the jungle hillside and witness the sparkling jewel of the resort, aptly named Emerald Bay, one of the world’s most beautiful beaches. Keep your eyes peeled for the breeding hornbills, macaque monkeys and monitor lizards that can regularly be spotted. Sustainability and conservation are two areas that the staff of Pangkor Laut and its parent company, YTL hotels, are passionate about pursuing. To maintain the colourful tapestry of natural beauty of the island, Pangkor Laut is committed to conserving the island and its surrounds as best as possible. From missions including reducing plastic use and intending to go plastic free by 2019, to organising beach clear ups to eradicate the plastic waste washing up on the shores and partnering with Reef Check Malaysia to save the coral reefs surrounding the island. Encouraging conservation efforts further, the resort's naturalist Aris has developed breeding houses for the Hornbill’s which called Pangkor Laut home, using fully recycled materials, even down to the logo pulled from a broken umbrella, to complete the endeavour. As befits a luxury resort, a visit to Spa Village at Pangkor Laut is in itself a reason to schedule a trip to the private island. Highlighting Malaysia’s diverse melting pot of cultures, coupled with the wealth of natural resources, the Spa Village is a celebration of some of the world’s most ancient health rituals. Undeniably luxurious and rejuvenating, the spa experience honours the traditions of ancient bath rituals from the abundance of healing cultures of the region. Even just a wander through the open courtyards, lotus pond, library, bath houses, nap gazebos and reflexology path of the spa will help melt tension off your shoulders. If you do book in for a session, prepare for an absolute treat, as each treatment here begins with a unique and memorable bath house ritual that will soothe your body, mind and spirit. Beginning with a soothing foot bath, followed by an invigorating Chinese Foot Pounding, you will then be wrapped into a traditional spa sarong and escorted to a bath house and wishing well to set good intentions. Once your wish has been made, you move through an icy cold waterfall shower to a traditional Malay “circulating” bath, inspired by the invigorating steams in which villagers once bathed. Moving on to a Japanese style cleansing experience in a traditional bathhouse, you fill up a small pail handle to wash yourself while seated on a small stool, before taking a dip in the heated Rotenburu rock pool. Nearly fully cleansed, you are then treated to an exfoliating and deep cleansing Shanghai Scrub to finish up the pre-treatment ritual. With each pore of the body fully cleansed and awakened, there is time to taking a pause at the library to absorb the serene peace before the treatment will commence. With an array of massages or opportunities to take private consultations with many specialists on site, including an Ayurvedic doctor or a visit to the Chinese Herbal Hut, on this occasion I opted for an 80 minute deep tissue massage complete with aromatherapy oils. A memorable, cultural experience of many ancient healing protocols that incite wellness, the treatment rejuvenated my senses and was a true gift in offering genuine care and holistic respect for my body and spirit. As with all of the YTL resorts, Pangkor Laut boasts a holistic wellness offering for guests to complementarily enjoy during their stay. With a fully kitted out gym, overlooking the sea beyond, tennis courts for a pulse-raising match, daily yoga led by visiting international guest artists (with personal training sessions available on request), a bevy of water sports and jungle walk tracks all within the resort grounds, there are fitness pursuits that will suit the palette of every type of wellness traveller. I was fortunate to attend Pangkor Laut as a guest and Pilates instructor for the first (of many, I hope!) Guava Pass retreat in collaboration with YTL Hotels. This wellness driven escape enabled us to maximise the beautiful surroundings of the resort, taking daily HIIT, Pilates and Yoga classes amongst some of the most idyllic locations across the island. With a natural synergy between the resort and holistic activities, Pangkor Laut is an ideal host for wellness retreats, fitness getaways or adventure enthusiasts. Want a quick Pilates routine for when you're on the road? Try this sequence out!